Ambedkar, the grandson of Dr Babasaheb Ambedkar, is contesting the upcoming Lok Sabha election from Akola and Solapur constituencies in Maharashtra as a candidate of Vanchit Bahujan Aghadi. A day after he was booked for his remarks against the Election Commission (EC), Dalit leader Prakash Ambedkar on Friday accused Prime Minister Narendra Modi of being a blackmailer. Addressing a poll rally at Akola in Maharashtra, Ambedkar alleged that Modi blackmailed the UPA chairperson Sonia Gandhi and her party saying if she did not want her son-in-law Robert Vadra to be in jail, they should refrain from joining hands with any other party. “Can anyone tell me why Congress did not have an alliance with any other party across the country? Modi had put a condition that if Congress party wants Rabert Vadra not to be in jail, then it should refrain from forging an alliance with any other party,” he claimed. “That is why Congress did not have an alliance with any party. Modi is a blackmailer. He is blackmailing Sonia Gandhi and everyone else. This is Modi’s style of functioning that Congress party did not have an alliance with the Aam Aadmi Party (AAP) in Delhi and Mamata Banerjee in West Bengal,” Ambedkar alleged. 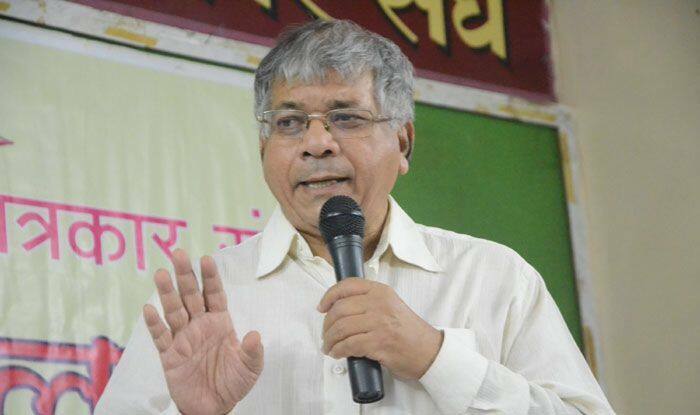 Ambedkar, the grandson of Dr Babasaheb Ambedkar, is contesting the upcoming Lok Sabha election from Akola and Solapur constituencies in Maharashtra as a candidate of Vanchit Bahujan Aghadi (VBA). VBA is an alliance of Ambedkar-led Bharip Bahujan Mahasangh (BBA) and Asaduddin Owaisi’s AIMIM. The VBA is contesting all 48 Lok Sabha seats in the state. Ambedkar was in talks with the Congress-NCP for the Lok Sabha elections. The Congress-NCP combine had been trying to bring Ambedkar, who has pockets of influence in the state, in its ‘maha agadhi’, a grand alliance of anti-BJP parties. However, talks in this regard remained inconclusive. On Thursday, Ambedkar had said at an election rally at Digras in Maharashtra’s Yavatmal district that he will jail the EC for two days if voted to power for not letting political parties speak about the Pulwama terror attack. Later, a case was registered against him under IPC sections 503 (criminal intimidation), 505 (statements conducing to public mischief), 189 (threat of injury to public servant).